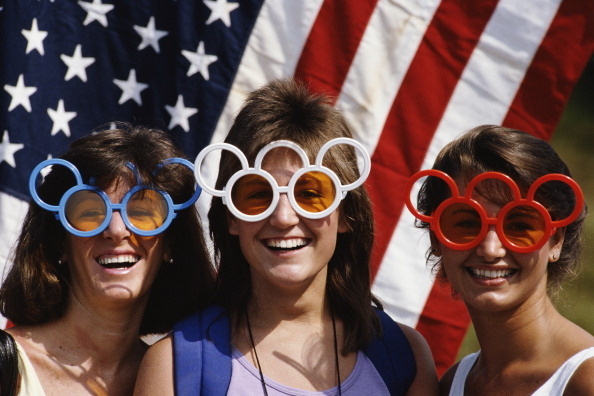 Local sports fans wear patriotic Olympic Rings sunglasses during the 1984 Olympic Games in Los Angeles, California. 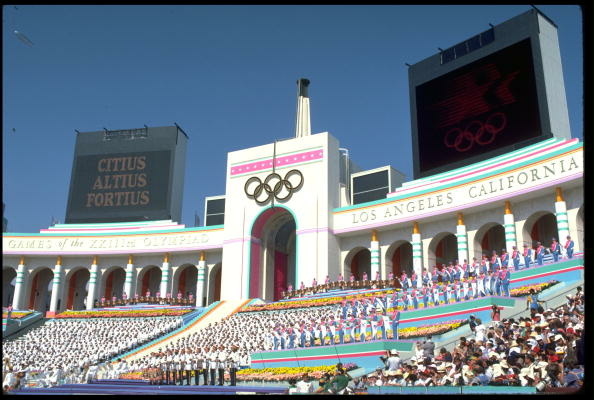 The Olympic motto of Citius, Altius, Fortius is displayed on a giant TV screen at the opening ceremony of the 1984 Olympics at the Coliseum in Los Angeles. A performer wearing a "space-age jetpack" stuns the crowd at the Coliseum by flying around the stadium at the 1984 Olympics. 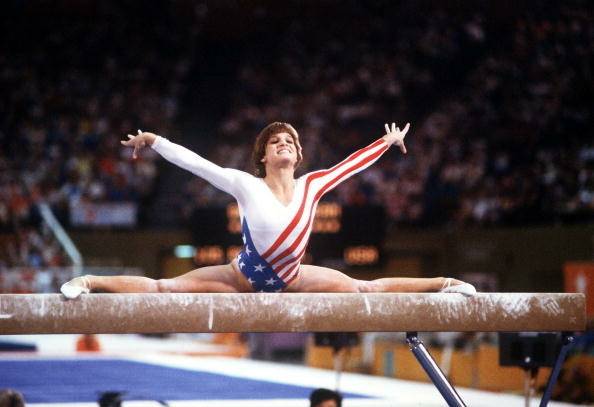 USA's Mary Lou Retton who won the gold medal in the Individual Combined Exercise and silver in the Horse Vault. 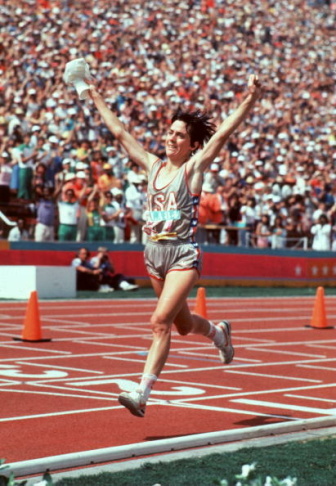 Joan Benoit wins the first women''s Olympic marathon during the 1984 Olympics at the Coliseum. 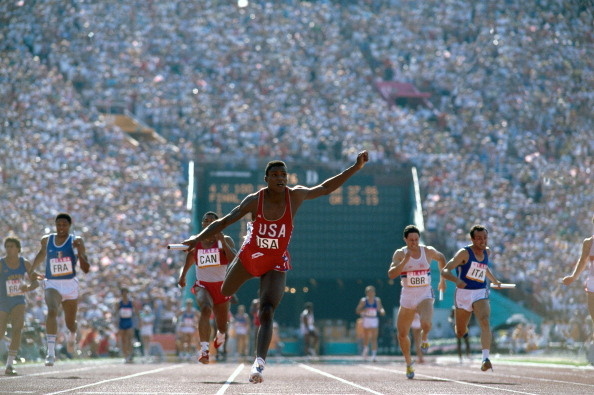 USA Carl Lewis in action, leading race and setting world record after taking baton from teammate Calvin Smith during Men's 4x100M Relay at Los Angeles Memorial Coliseum. Lewis won four gold medals: 100M, 200M, 4x100M relay, and long jump. 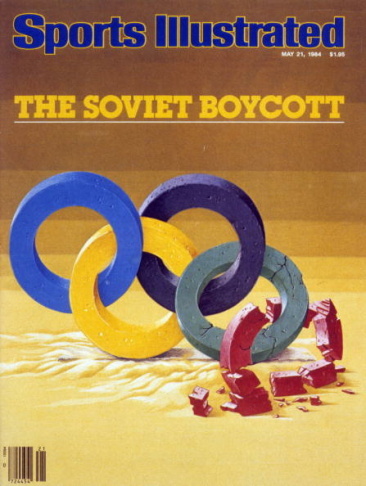 This is the May 21, 1984 Sports Illustrated Cover that shows an illustration of fractured Olympic rings after the USSR boycott of Los Angeles Olympics. Boston's bid to host the 2024 Olympics is over. That means Los Angeles is back as a likely choice. 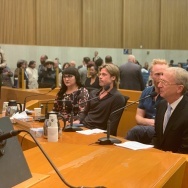 This city and U.S. Olympic Committee will have to get its act together quickly, though; 0nly seven weeks remain before cities have to be officially nominated. L.A. Mayor Eric Garcetti is eager to resume talks with the U.S. Olympic Committee. More on that here. 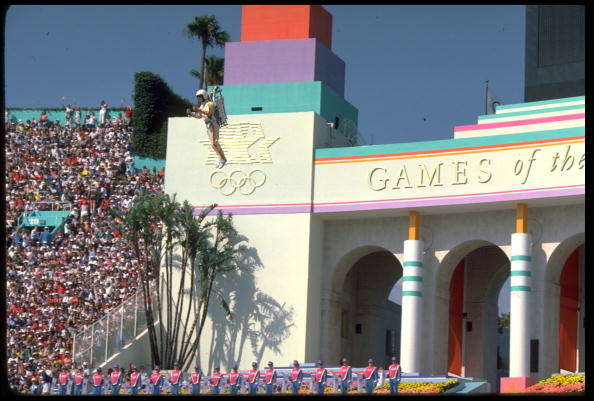 Some were thrilled at L.A.'s newfound hopes to host the games; others, not so much (you can weight in in our poll on the matter) Either way, there's been a lot of chatter about the last time the Olympics came to L.A. Here's a recap: U.S. President Ronald Reagan opened the ceremony at the L.A. 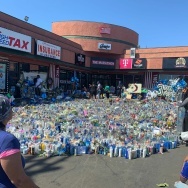 Coliseum on July 28. Some say they were the most successful ever. Why? Because L.A. was "fiscally responsible" and employed an "innovative architectural strategy," according to Gizmodo. You may remember this guy, also known as Sam the Olympic Eagle. 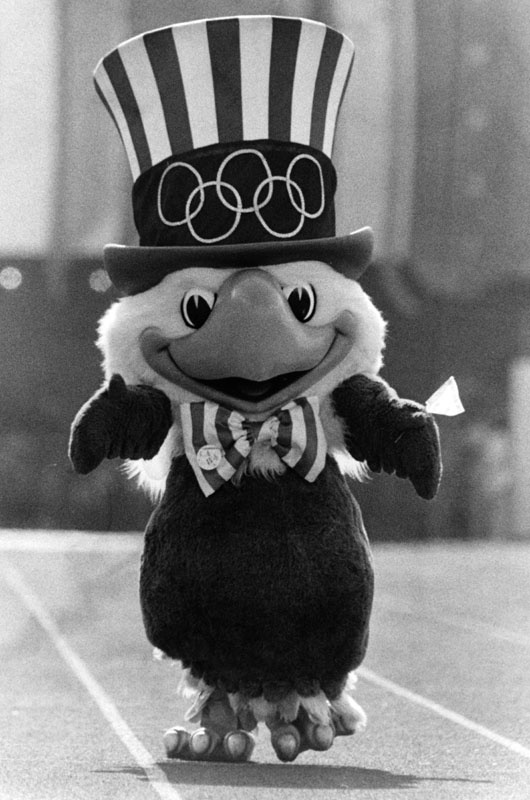 He was the official mascot. The Opening Ceremony aired on ABC with announcers Jim McKay and Peter Jennings — worth watching if only for the on-camera entrance of the "jet man" (beginning at 6:30). 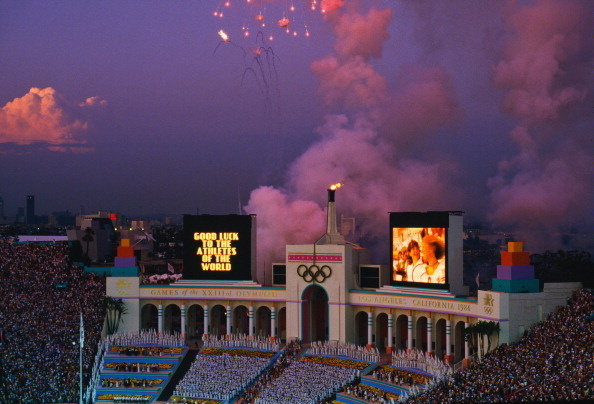 This was the second time L.A. hosted the Olympics. 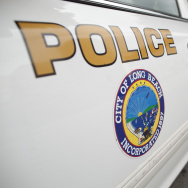 The first was in 1932 (forever memorialized in L.A. infrastructure like Olympic Boulevard). Athletes practiced at venues around L.A. 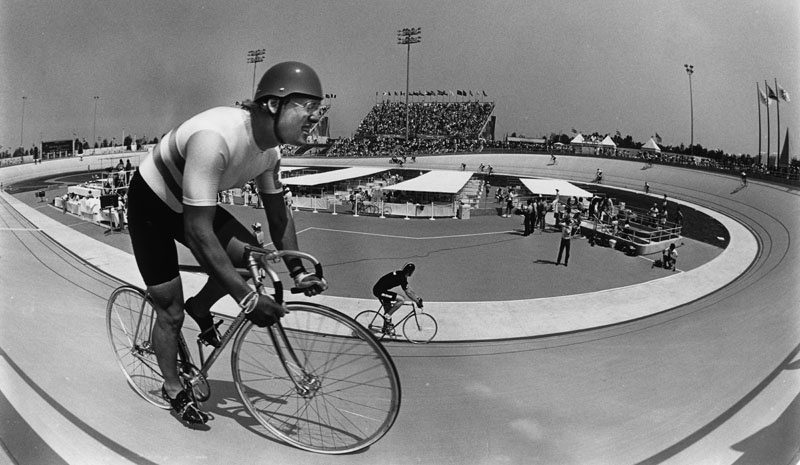 In this archival photo, cyclists warm up at the Velodrome at California State University, Dominguez Hills, prior to competition on July 31. 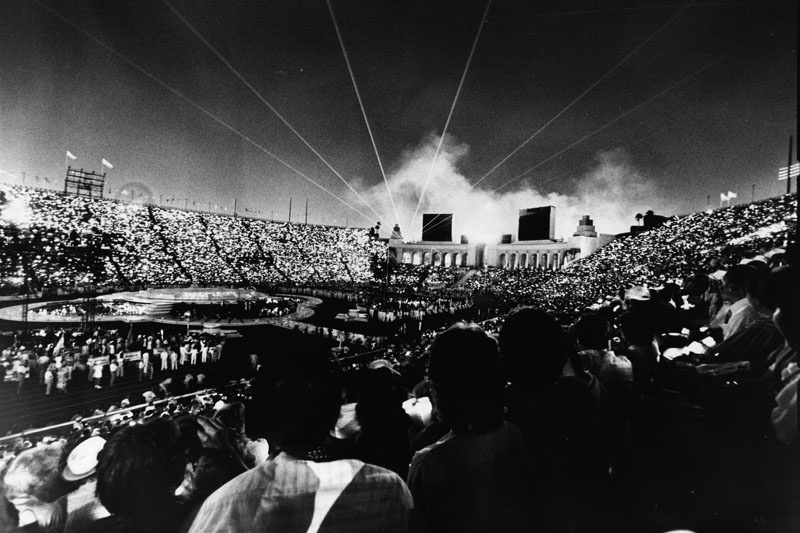 The Olympic Swim Stadium — later McDonald's Swim Stadium — on the University of Southern California campus, was built for the 1984 Summer Olympic Games and opened in July 1983, according to the L.A. Public Library Photo Collection. And here's a fun fact: Synchronized swimming first became an official Olympic sport with both solo and duet competitions at the 1984 Summer Games. This photo — taken from the L.A. Public Library Photo Collection — was originally published in the Herald-Examiner on August 10, 1984. 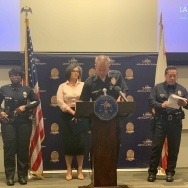 The caption read: "The United States' Candy Costie and Tracie Ruiz — or is it Tracie Ruiz and Candy Costie? — perform their nearly perfect, gold-medal duet in synchronized swimming at USC Stadium pool." The pair won the gold medal for their routine, "Duet." 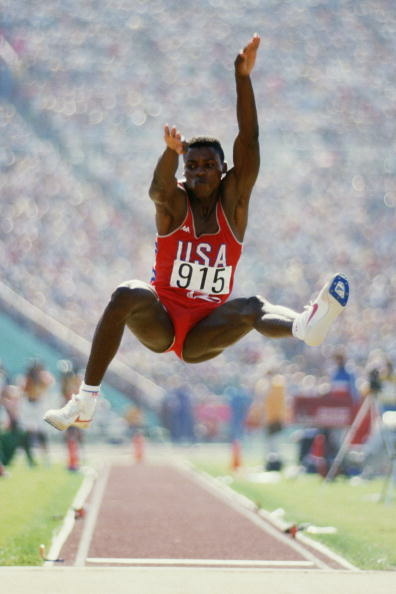 And then there's the legendary Carl Lewis of USA. This photo is from the Long Jump final. Lewis won the gold medal with a jump of 8. 54 meters at the Coliseum Stadium on August 6. He also won gold medals for the 100M, 200M and 4x100M relay. 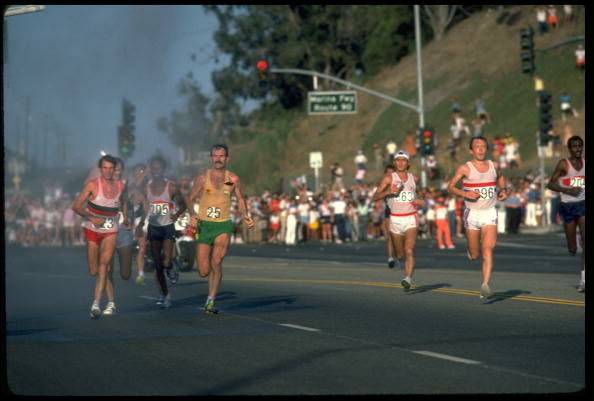 In this photo, you see the competitors of the men's marathon running through the streets of L.A. Carlos Lopes of Portugal, on the far left, won the Gold with a time of 2:09:21. The games concluded on August 12. Thousands of people packed the Coliseum to watch the Olympics Closing Ceremonies. Scroll through more archival photos in the slideshow above. Do you remember the Summer Olympics of 1984? Share your memories and photos with us using the hashtag #1984Olympics on Facebook, Instagram and Twitter. Tag us at @kpcc. 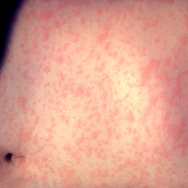 You can also tell us about it here. 2024 Olympics: Is LA a real contender, according to history? 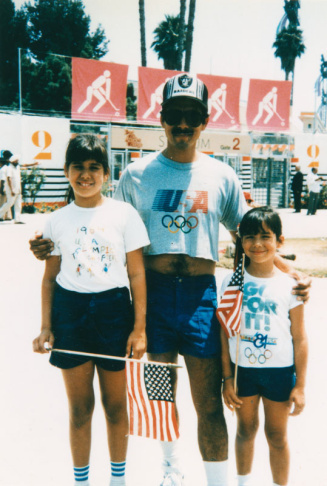 KPCC Asks: Were you in Los Angeles for 1984 Olympics?